"What are you reading Mum?" asked one son. "It's a horror story," I replied. "Boys Adrift" by Leonard Sax is a study into the growing problem of unmotivated teenage boys who grow up to be underachieving young men who fail to launch, have no aspirations and aren't interested in leading functional, productive lives. Sounds like a fun holiday read? Well, it wasn't that much fun to read really. But terror turned to thinking and discussing as soon as I had read the last page and I continue to ponder the issues. 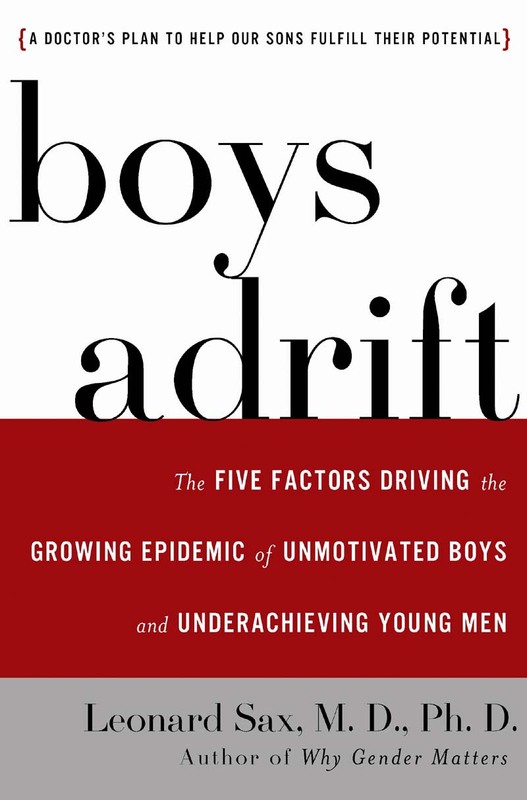 Sax looks at five areas that he thinks is contributing to the problem of boys adrift. 1. An education system that doesn't suit boys. 3. The effects of medications prescribed for ADHD. 4. Changes to the male body wrought by modern life - chemicals, plastics and so on. The evidence Sax has collected suggests that the male body is affected more than the female body. 5. A bundle of things including a growing shortage of good male role models, a devaluation of masculinity, no real rites of passage for boys coupled with too many trophies along the way and parental failure to show a little tough love (like mothers still doing the washing for their 30-somethings who still live at home). He provides a very in depth study into each of these areas and all five stand independent of each other. That is, one is not the cause of another. I really like this book because it reads real. It's not all neat and tidy. The author doesn't present each problem and then offer a five point plan on how to fix it. There are some solutions and ideas along the way but this is very much a work in progress and he is really just raising flags. What is terrifying then is that in some instances there are no solutions, not for an individual family anyway. Some of the problems raised are systemic issues that are just too big, and so in some senses the solutions lie in working out how to live, work and problem solve alongside these issues that aren't going away anytime soon. While he did suggest on at least a couple of occasions that some of the issues or consequences reaped were beyond solving, I think it's worth noting that since 2009 there has been huge research done on brain plasticity. More things are reversible than we previously ever imagined. It would be interesting to see how his thinking has developed. And as a Christian and without being all silly about it, I believe that there is plenty that we can change through a growing, maturing, prayferful faith. Granted, Sax is not writing this study from a Christian perspective. Anyway, not a fun book but an important one I think. It is written thoughtfully and soberly. Sax has not set out to give anyone nightmares. This is all about education and awareness. I thought it was helpful. Who else might find it useful? Parents of boys. Teachers. Youth group leaders and folk in university ministry. Observers of rapid sociological change. Now, I'm off to teach a couple of boys to use the washing machine. :-) Nah, just kidding. I'm off to make a cup of tea. 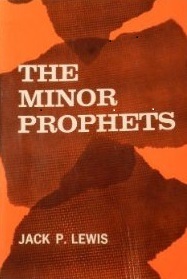 Speaking of the Minor Prophets, if you are looking for a resource to help you get into the last twelve books of the Old Testament then "The Minor Prophets" by Jack P. Lewis is the book for you. This book has been around for a while but wait...wait...WAIT! Don't switch off. Because I have just read some reviews of this book and lots of them said words to the effect of, "Still one of the best guidebooks to the Minor Prophets." Not that I had to read the reviews to find out about this book. I have just used it in preparation for Monday evenings and have studied it two or three times in the past during similar tilts through this section of the Bible. And I often refer to it during my personal reading of the Minor Prophets when it gets to that point in the plan. Why? Because it's short, concise and supremely useful. There is a chapter, each one no more than ten pages, for each prophet. Every chapter includes some general information about the prophet, where he fits into biblical history and dating as can best be determined (and where there is some debate Lewis outlines the possibilities.) There is a general overview of the book, a structure and some commentary on significant sections, key concepts and on some of the trickier bits than cannot be left unexplained. It's detailed but not technical. You can read it and reasonably speedily. Towards the end of each chapter Lewis mentions where each prophet is quoted or alluded to in the New Testament and brings the reader back to Jesus. And every chapter finishes with a short set of astute study questions. I don't think this book is in print anymore which is a huge shame but a quick search shows that there are still plenty of copies to found here and there. And if you are serious about learning not just to understand but to love this part of the Bible then this is THE book for you.